Johnathan Staley is our Mr. Wildcat 2019 winner. Runner up was Jonathan Mendez and 3rd place went to Fernando Castillo. Mr. Frey was the perfect MC of the evening with a few tricks up his sleeve. A special thanks to Mrs. Sheila Collins, Mr. Dave Hill and Mr. Julian Tubera for judging the participants. 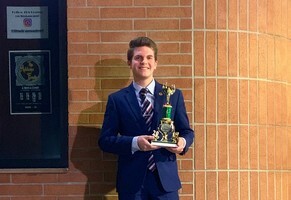 Congratulations to Brandon Bonifacio who won the regional Lions speech contest, making this his 3rd win and accumulating $500 in total thus far. 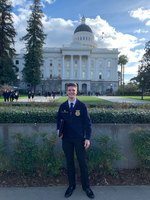 He will compete again on April 13th for a chance to win a $4,500 scholarship at the district contest. Ms. Peggy Herndon is serving as the interim principal as of January 1, 2019. Ms. Herndon will continue being the principal of Alternative Education (Sentinel High School & I.S.) and Adult Education. Ms. Herndon has been with the District a total of 19 years. Congratulations to Brandon Harden for winning second place in the Congress Debate. He qualified to compete at the State Speech & Debate tournament in Long Beach on May 2nd-5th. This is an amazing feat given that the WHS Speech & Debate team just started this year. We're rooting for you, Brandon!